Filed to: What time is the rams in LA?Filed to: What time is the rams in LA? What time is the rams in LA? Who cares who won the Super Bowl—Los Angeles is getting a football team (again)! 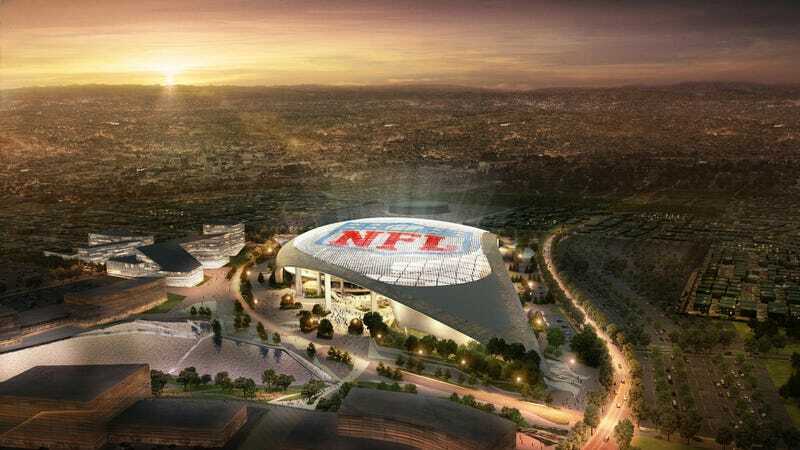 But luring the St. Louis Rams to Los Angeles was perhaps the easy part of a much bigger challenge when it comes to the urban planning issues around the stadium itself. The open-air plan embeds the stadium into the ground, surrounded by zig-zagging ramps, sunken gardens, and a lake. Arching above it all is a high-tech ETFE canopy—a superlight and hyper-efficient inflated polymer skin that will be transparent to keep out noise and rain while taking advantage of all that Southern California sun. To be honest, it looks more like a really nice mall than a stadium. But it’s where the stadium is situated that’s the problem. The stadium will be located not in Los Angeles proper but in Inglewood, which is its own city surrounded by the city of LA (yeah, we’ve got 88 cities in Los Angeles County, deal with it). It will sit on the site of the former Hollywood Park racetrack, which had been demolished a few years ago and was already being developed into a gigantic live-work complex. The stadium makes what was already a great project for Inglewood even more of a big deal. But there’s one glaring omission in the plan: How people will get there. Yes, of course, there will be parking. One might be able to drive a car. But any serious proposal for a stadium in today’s LA—or, rather, future LA—needs to have reliable, high-capacity public transit as part of the plan. Does this stadium? No, and as Hawthorne points out, there’s kind of a cruel joke being played on LA. For the last two weeks—just as the deal was being struck with the Rams—a tunnel boring machine has been transported to the construction site of the new Crenshaw Line. This light rail line (with some underground components) will connect South LA to the city’s existing rail transit system by 2019 and to LAX (well kinda, via a people mover) by 2023. In the ultimate transit tragedy, this line will get about 1.5 miles from the stadium. That’s 1.5 miles I will gladly walk in order not to pay for parking or deal with post-game traffic. But that’s not close enough or direct enough to convince most people to leave their cars at home. Was Inglewood the wrong choice? No. In fact, for many reasons Inglewood is the best choice. There were several competing proposals to locate the stadium in different places outside LA, like Carson and City of Industry, which were certainly not any better options when it came to transit accessibility—in fact, fans would almost certainly only drive to those locations. And there is a faint possibility that planners might reroute the train in light of the stadium news (they’ll definitely add a free shuttle bus, which is... fine, but not a train). But I’m a little sad that a certain proposal for downtown LA wasn’t more seriously considered by the Rams. That plan would have dropped the stadium in the heart of one of the densest and fastest-growing neighborhoods in LA, and within a few blocks of rail lines spreading out to every corner of the city.